Clash Of The Titans is a Warner Bros. licensed video slot based on the same-name fantasy film released in 2010. Many symbols of the slot feature still images from the film, for example, a movie poster showing a toothy beast and Perseus riding the Pegasus, or a close-up of the film protagonist, and other themed symbols. 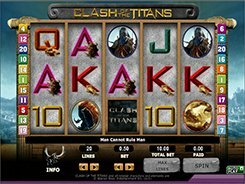 Clash Of The Titans is a 5-reel 20-payline slot providing a good level of entertainment and decent winnings. The number of coins per line is fixed at 1, and a coin size is adjusted between $0.05 and $5, thus a total bet may vary from $0.05 to $100 per spin. The slot features a wild (Perseus) that helps make up winning combos by substituting missing symbols. The wild is the biggest-paying icon that awards 10,000 coins if five of them land across an active payline. 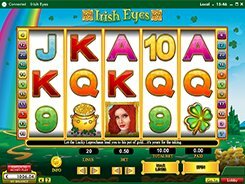 Besides, the slot offers the Pick and Win bonus game that is unlocked by hitting a wild symbol on both reel 1 and 5. There is also a free spin feature activated by three or more scatter Logos that may appear in any position on the reels. PLAY FOR REAL MONEY!